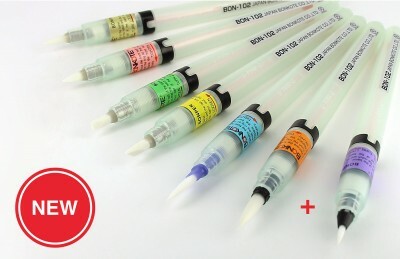 The new Bonpen kit by Bonkote contains now 7 different Bonpens. In addition to 6 pens of previous kit you will find a new model - BON-102S - with ultrafine 2.5mm ø brush for fine and precise point application. Bonpens are refillable pens, that enables accurate flux application on your work area. You can also use a single cartridge and simply buy the various replacement tips. For more details please check our Bonkote leaflet.